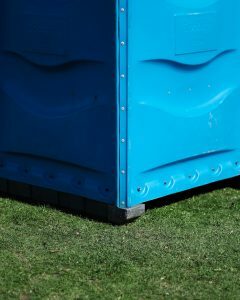 Now that summer has arrived, it’s the prime season for restroom rentals — whether that is restroom trailers or porta-potties. The reason summer is such a great time for the restroom rental industry is because there are so many weddings, graduation parties, fundraisers, and other events held outdoors due to the nice weather. Colorado offers many scenic locations to host events, but many lack amenities such as restrooms. Front Range Septic has recently expanded their services to include restroom trailer rentals for any event you may be hosting. 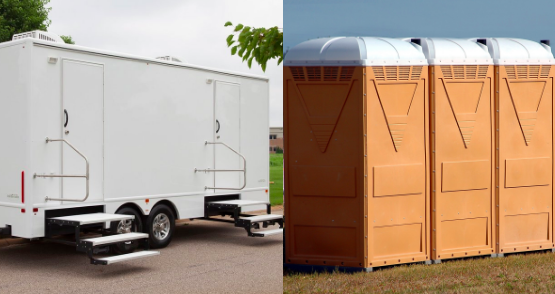 In this blog, we will explain some differences between restroom trailers and porta-potties. 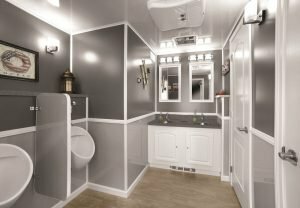 Restroom trailers feature the same amenities as a household restroom, but they are fully contained on a portable trailer that can be delivered to your location. They come in many sizes and floor options depending on the size of the event and expected number of guests. They are designed to look more elegant and aesthetically pleasing from the exterior. They are the more popular choice when it comes to events such as weddings, graduations, and private parties. If you’re looking for a more refined restroom for your event then a restroom trailer is the better option. Porta-potties are used for more informal occasions. They are designed as one single self-contained unit and are typically made of hard plastic materials. Porta-potties can be rented in bulk so you can use as many units as you see fit. Often times these will be used for construction sites, festivals, or events that expect to have hundreds of people in attendance. Restroom trailers are climate controlled with either heat or air conditioning. There are typically multiple stalls per unit and some even offer private stalls. The toilets are flushable and they have sinks with running water. They also offer mirrors and lighting both inside and outside of the unit. Some even feature decorations or artwork to make them look and feel more elegant. Porta-potties are individual toilets that generally don’t have any flushing functionality. They include toilets with lids, locking doors, and usually hand sanitizer dispensers inside the units or communal hand washing stations outside of the units to ensure cleanliness. They don’t offer any lighting, so for nighttime events you will need to consider options for lighting. Also, they are not climate controlled and can get quite hot inside during the summer, which could be the cause of odor. Restroom trailers are typically cleaner, more aesthetically pleasing, and have no odor. They offer all the same comforts of a home or event facility restroom, so you don’t have to sacrifice the location of your event due to lack of facilities. They will cost more, but if you provide your guests with nice restroom facilities, they will want to stay longer and will enjoy themselves more at your event. Also, if you are hosting a fundraising event, you will want your guests to stay longer so they spend or contribute more money to your organization. Porta-potties are considered an affordable solution for large events and until recently they were about the only option available. Also, since they are single units, they can fit in areas where space is an issue. If you aren’t worried about the visual aspect and functionality of your restrooms then this might be a good option for you. Front Range Septic has specialized in the septic and grease industry for more than 10 years. That’s why we know how important it is to offer a simple, sanitary solution when it comes to waste. In order to extend our services in the waste industry, we are now the proud owners of Refined Restroom Rentals. Refined Restroom Rentals offers elegant restroom trailers for outdoor events. We can provide units throughout the Northern Colorado, Western Nebraska, and Southern Wyoming area. If you’re interested in more information on our restroom trailers, give us a call today at 970-800-1006.